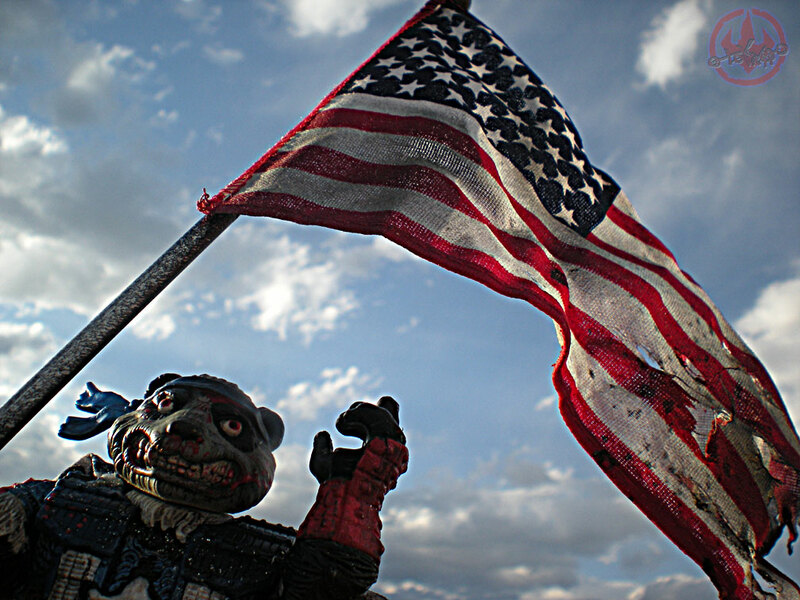 –>> GGM remembers all of our heroes . The 'Panda Khan' Power Couple !! “Endangered Species” takes on a new meaning when the Lord of Death attacks the Brotherhood of P’an. 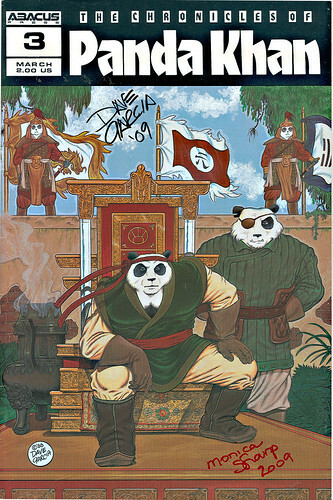 The Master of Nightmare plots the destruction of the Panda Clan living in the Caterpillar Mountains. Will his evil machinations rouse the Earthquake Beetle from his eternal burrowing ? 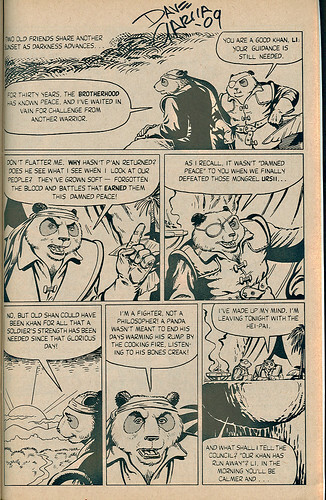 Li Yang, the Panda Khan is unique in his ties to TMNT lore and a special, though somewhat elusive ally and friend to the Turtles and Usagi Yojimbo dating back to the very early days of both comic series. 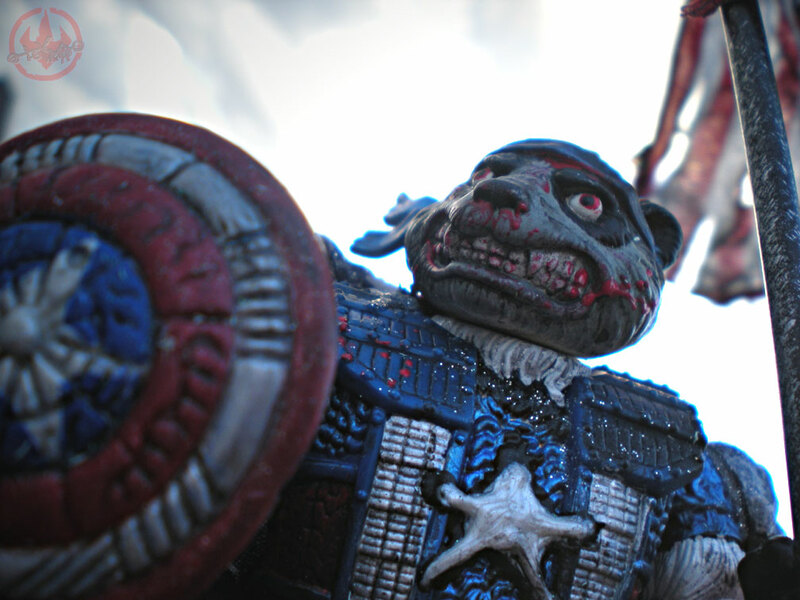 Most kids in the early 1990s were familiar with the infamous Turtle action figure, but some just “BEARLY” the associated comic mini-series. 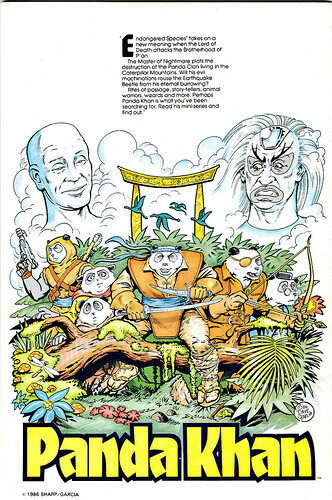 The reason for Li Yang’s inclusion into the TMNT Playmate’s toy fold aside from creator’s Garcia and Sharp’s friendship and association with Mirage was also that at some point P.K. 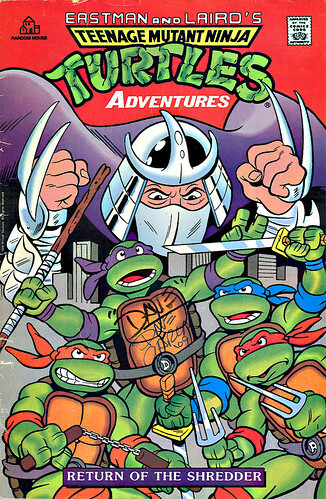 was to appear in the original TMNT cartoon show !! This is very similar to the effect of the deal made with Stan Sakai and the now iconic cross-over history that Usagi Yojimbo and his friends have had with the TMNT. 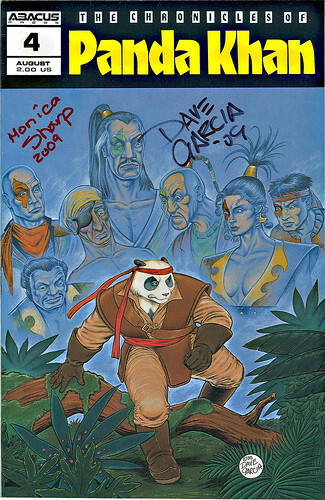 It should also be noted that Dave has also shared his illustrative talents with the Turtles including appearances including 1991’s “Turtle Soup” anthology and some of the earliest “TMNT ADVENTURES” titles. Dave now is well known for his work on Ben Edlund’s insanely famous : “The TICK” !! 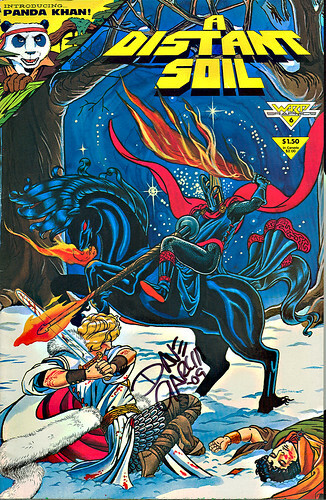 As far as i have discovered, the Big Bad boy warrior bear and all his spacey pals make some of their first appearances in Colleen Doran’s “A Distant Soil” in 1985. 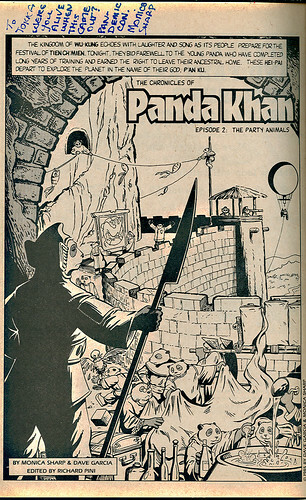 An early version of the “The Chronicles of Panda Khan” appear in Doran’s cult favorite book , edited by Richard Pini of ‘ Elfquest’. 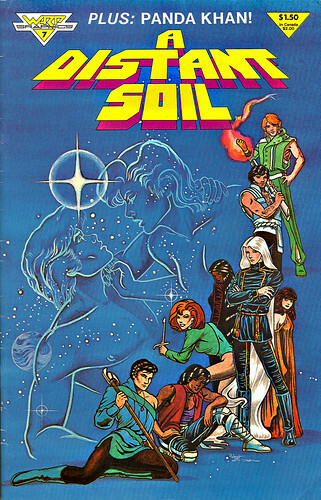 The actual mini-series would span four issues and a hand full of fun crossovers between 1986 – 1990. 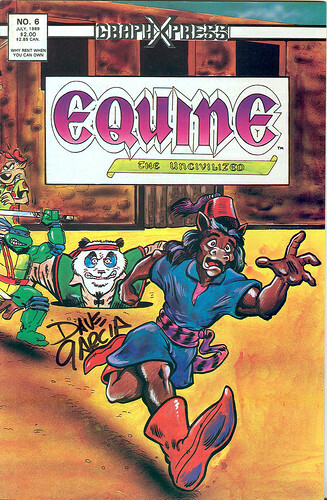 ..comic cross-overs / pre- TMNT include an appearence in Usagi Yojimbo & the laugh out loud series EQUINE THE UNCIVILIZED #6. Here Li Yang shares cameos with the Turtles and Usagi as well as whole cavalcade of famous anthropomorphic comic critters !! 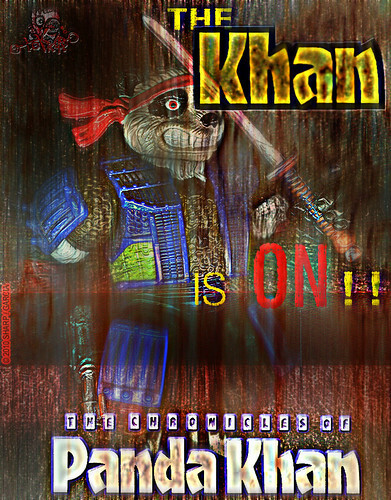 Some of his Pre-TMNT final appearances as far as i can tell are in 1989’s Varmit’s Cross – over entitled “X-Khan” & the “Panda Khan – Special #1” from 1990. What you see here in this posting is NOT a complete listing of all of P.K.’s comic appearances. This is what i have in possession. I shall have to confirm with Dave and Monica on ALL of his appearances. 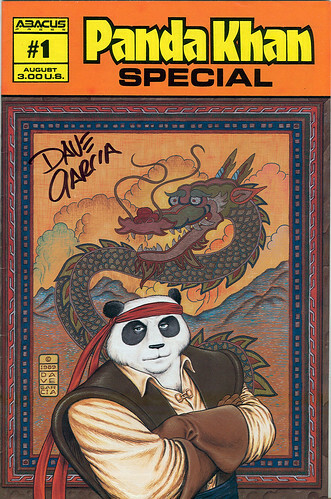 In 2008’s Comic-con i had the special honor of meeting Dave for the very first time after many years of searching. 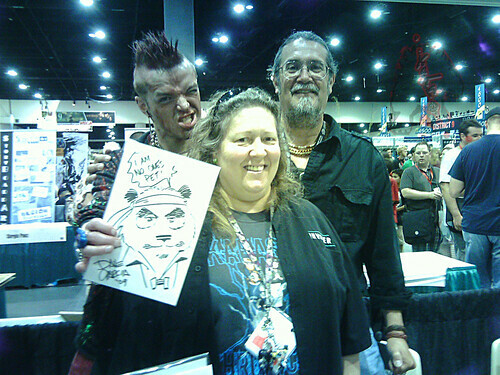 In 2009, following the TMNT and Usagi’s 25th anniversary roles of honot at the CON.. i managed to also catch up with Dave’s better Panda Half and Li’s Co-creator Monica Sharp !! !! The fun loving duo informed me about a few things in our exciting exchange and how some seedy ‘ SUITS ‘ wanted control over PANDA KHAN and rights outside of Dave and Monica’s to do with P.K. as they saw fit. It just wasn’t right. 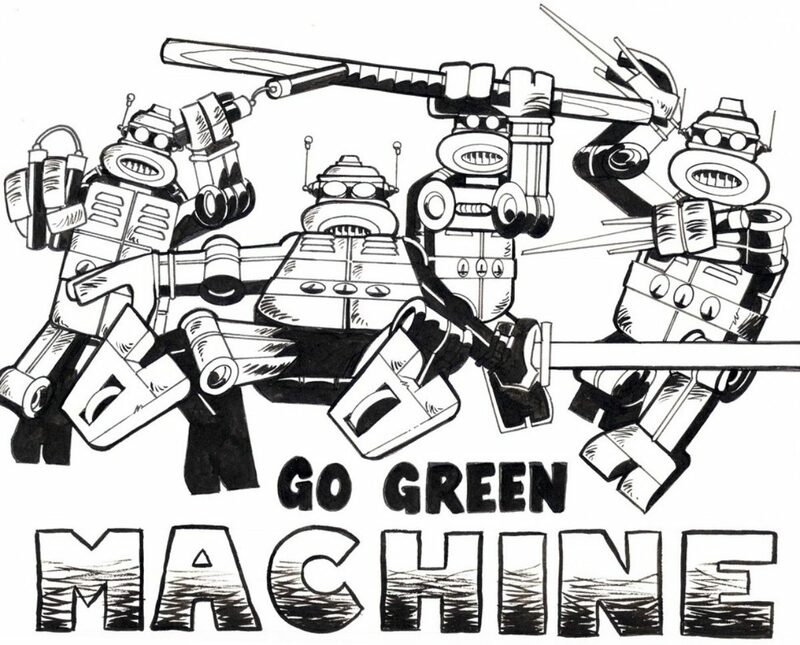 I have a feeling this greased the wheel to nix the appearance of Li in the Turtles T.V. show. This is speculation on my part however. This tales of this powerful warrior and his heroic allies from the far-out, far – flung , and freeky SCI – FI future is filled with monsters, bugs, space-pirates , and a very evil wizard. I highly recommend seeking out Li’s classic adventures not just for the Dave’s graphical visuals and Monica’s narrative excitement but just for the absolute pure FUN of it all !! P.K. is damn FUN READING and outright COOL !! Seriously !! You don’t know what you you’ve been missing in all of this and so much of the awesome, and unique story telling lies beyond Li’s action figure !! Li’s signature phrase is ” I AM NO ONE’S PET ! ” . This is not some cute little wording typed up by Playmate’s Toys marketing and packaging guys. 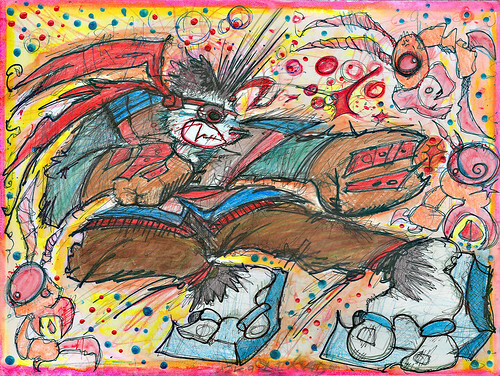 This comes directly from the aforementioned Panda Khan short – story “X-Khan” . When the evil Business Pirate and Crime Lord known as “The Cleaver” wishes to keep P.K. and his lovely pelt as an acquisition and ‘ Beat of Burden ‘. Thus disrupting a trade with Khan’s Tong Pirate allies. The Cleaver and his associates then wish to de-claw P.K. But with the help of his powerful and ancient ‘ Dragon’s Claw ‘ sword , The Cleaver and his associates leave the business to Beaver and thus retire from criminal activity permanently !! 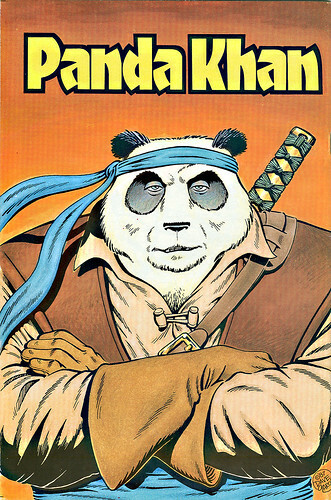 It’s been noted to me that the classic Panda Khan stories are set to return for reading by a whole new generation via the net. As well as Dave’s awesome, Cowboy Zombie – filled fun Shadow of the West, The Legend of the Night Ranger. I’ll have further information on this as it develops !! 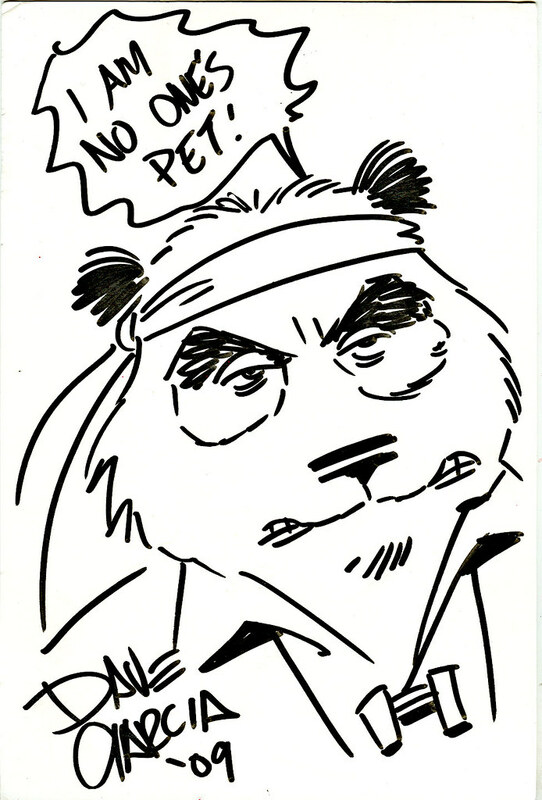 Original PANDA KHAN art is still in the possession of Dave and Monica and for now is not for sale. Interestingly enough, the only P.K. 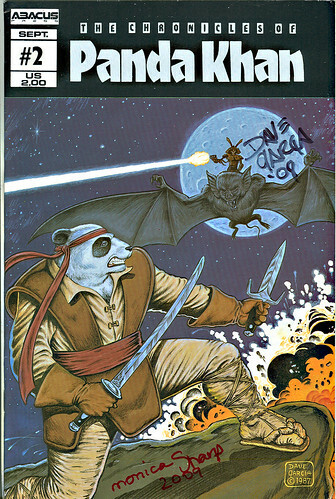 art used from the original comic stories owned by a third part is in the collection of a – 1 STAN SAKAI !! !! That didn’t stop Dave from creating some awesome NEW LI YANG art just for me .. now i have the honor of sharing it with you !! !! 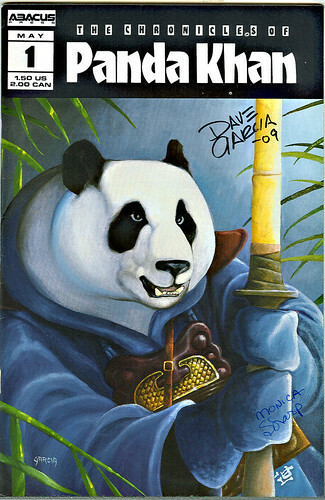 Author tOkKaPosted on July 30, 2009 Categories Comics, Conventions, Special Feature PostsTags DAVE GARCIA, LI YANG, MONICA SHARP, PANDA KHAN, Shadow of the West - The Legend of the Night Ranger, stan sakai, usagi YojimboLeave a comment on The 'Panda Khan' Power Couple ! !